The Easy Events Confluence app helps teams organize events and their participants in Confluence quickly and easily. 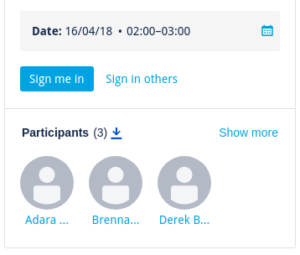 You can display event information on Confluence page in a space, and let users register themselves to participate (or de-register) with just a click. It works much like a Xing event page - but it has more features and is fully integrated into your familiar Confluence system. Easy Events now lets you bring the digital into the physical. Even though the modern workplace with all its tools is extremely digital - paper lives on and is used in many situations. In many cases, a paper list of participants is simply more practical and faster during the actual company event. Easy Events now lets you export participant lists in CSV format, and print them directly to paper. The use cases are obvious. Event organizers would like to check participants upon arrival against a registration list at the even't reception to note attendance quickly. Alternatively, a paper list lets participants sign against their own name on the list. Easy Events for Confluence now covers these use cases with its practical export function: Simply save the list of participants as a CSV file, print it out and have it in hand for the day of the event. The most recent version of Easy Events for Confluence is available from the Atlassian Marketplace: You can test the app in your own system without obligation to see what all the features can do. Do you have any questions or suggestions? Contact us: Our development team looks forward to your feedback! By the way, we've renamed Easy Events to be Linchpin Events. Did you know it is one of the core apps in Linchpin, our Confluence-based social intranet suite?